I. Meteors and meteoroid streams. II. Observations of the zodiacal light. III. Interplanetary dust. IV. 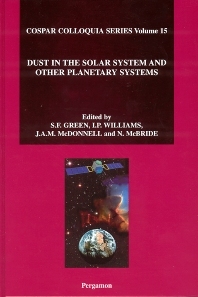 Dust in the outer solar systems and other planetary systems. V. Cometary dust. VI. Laboratory Studies. VII. The near-Earth environment. VIII. Evidence from meteorites. Index. Author Index. Keyword Index. Since the last joint IAU and COSPAR Colloquium in Gainesville in 1995, there have been dramatic changes in the field resulting from in-situ space experiments, Earth orbiting satellites and ground based observations. The brightest comet since the early years of the twentieth century, comet Hale-Bopp, appeared, giving an invaluable opportunity to see in action one great source of interplanetary dust. Similarly, the Leonid meteor shower has been at its most active since 1966, producing spectacular displays of meteors and allowing for an array of observational techniques, not available in 1966 to be used, while theory has also been refined to a level where very accurate predictions of the timing of meteor storms has become possible. Prior to the meeting a total eclipse of the Sun in South West England and North Europe was observed, traditionally a good opportunity to observe the Zodiacal cloud. The knowledge of the Near-Earth Asteroid population has also increased dramatically, with the increased study arising from the heightened awareness of the danger to Earth from such bodies. Extrasolar planets have been discovered since the last meeting and it is recognised that interplanetary dust in other Planetary Systems can now be studied. Since much of the dust observed in such systems is at a distance of order 100 AU from the star, this brings into focus the production of dust in the Edgeworth-Kuiper belt of our own system. Recent years have seen a recognition of the importance of dust originating outside our own system, that is now present in the near-Earth environment. As is always the case when great strides take place observationally, much theoretical work follows, and the same is true in this instance. While data about the planetary medium from Venus to Jupiter was beginning to be available at the meeting in 1995, the data from both Galileo and Ulysses have now been more fully analysed, with a corresponding increase in our knowledge. This book reflects the thematic approach adopted at the meeting, with a flow outwards (from meteors in the atmosphere, through zodiacal dust observation and interplanetary dust, to extra solar planetary systems) and returning (via the Edgeworth-Kuiper belt and comets) to the Earth, with laboratory studies of physical and chemical processes and the study of extra-terrestrial samples.